Instead of being places of care and refuge, medical facilities have become the sites of massacres and looting. Malakal, South Sudan – The aid worker could only watch as hundreds of survivors of an attack on the Malakal Protection of Civilians (PoC) site in South Sudan frantically looted the only surgical facility for hundreds of miles. The 48,000 residents of the UN camp’s sea of metal shelters had sought protection from the country’s civil war there. But on the morning of February 18, the war caught up with them. At least 25 people were killed and around half the shelters destroyed in an act Ban Ki-moon, the UN secretary general, said could constitute a war crime. The following day, as the thousands who had fled returned, they began to scavenge through the rubble for anything that could be of use. Metal pots and plastic jugs that could transport water became as valuable as money. The medical clinic run by the International Medical Corps (IMC) – a simple tent with metal sides – seemed to hold the greatest promise. It offered basic surgeries but was equipped with valuable medical equipment. Children sat in the shade, rummaging through piles of now meaningless paperwork for any valuables. Women collected scraps of wood in the rubble. A small boy marauded around the site with a machete, aimlessly hacking away at empty boxes. “No surgeries for you!” the aid worker shouted over and over at nobody in particular. About 100 metres away, a clinic run by the International Organization for Migration (IOM) was still smouldering from the fire that had swept through the camp the day before. This was a primary healthcare centre with a maternity ward, family planning centre and a programme focused on preventing mother-to-child HIV transmission. When NGO workers toured the site, they said it appeared deliberately torched – the surrounding buildings were relatively untouched by the flames. Most of the expensive equipment here was also gone – lost to the fire. According to a report by Human Rights Watch, medical facilities in South Sudan are at long-term risk of destruction, but in recent months they have come under increased attack. Less than a week after the destruction of the health facilities in Malakal, a clinic run by Doctors Without Borders (MSF) in Pibor, about 250 miles from Malakal – the only healthcare provider in the region, according to the organisation – was looted. “Currently, it’s as pervasive as it’s ever been in terms of the lack of respect for medical functions [worldwide],” said Leonard Rubinstein, the director of the programme on Human Rights, Health and Conflict at Johns Hopkins University in the US. And South Sudan has become one of the most dangerous places for medical facilities. A few miles from the rubble of the two healthcare clinics in the Malakal PoC lies the Malakal Teaching Hospital. It was once the primary hospital in South Sudan’s second-largest city, but when fighting engulfed Malakal in 2014, it became the scene of a massacre. One man, who did not give his name, sat in the shade of the hospital entrance, as if to guard the nothingness behind him. He remembered what had taken place there. When the Nuer “White Army” attacked, around 3,000 people took shelter in the hospital. “The population was settled [in the hospital], and when the ambush came, all of them were massacred. I can’t tell how many were here,” he said through a translator. According to a recent UN report, the attackers “went round the hospital demanding money and valuables, and beat or shot those who didn’t have anything to give”. “They targeted specifically Dinka and Shilluk persons and allowed Nuer persons to leave the hospital,” the report continued. Investigators found 15 bodies, but witnesses said that many had been transported to the Nile River, a few hundred metres away. The hospital’s equipment is now long gone. The man who sat outside gave a tour of the hospital, winding through the piles of rubbish and pointing to the bullet holes in the wall where he said people were shot. “Medical structures are at risk when insecurity erupts,” said Tim Fillip Ros, the healthcare-in-danger project manager at the International Committee of the Red Cross. To stop the destruction of medical facilities, he believes hospitals must be thought of as a communal asset and not just as another building. “If you damage a healthcare system, you are not just damaging your perceived enemy, you are damaging your entire community for years and years to come. It’s not something which is easily set right,” he said. In Leer, a major town on the southern tip of Unity State, the population and its medical infrastructure have been devastated by the conflict which has swept through this town. On a recent Thursday morning, a line of women in colourful dresses waited patiently outside the gates of a recently opened MSF clinic, carrying children, many of whose eyes were caked closed with a white substance. A nurse who was new to the country said she had never encountered it before but it seemed to cause the eye to become infected. The absence of medical organisations since the autumn meant that existing health conditions had worsened without care. Building or rebuilding a clinic such as this one is a massive task. Everything must be flown in from Juba, and like most newly constructed facilities in wartorn areas, this one doesn’t have electricity. One of the biggest challenges for the clinic is finding qualified staff as many local doctors and nurses have themselves been displaced. “We had long-term MSF staff in our project that for sure have been displaced or fled because of the conflict. It’s more difficult to find our staff again, and to see if they are still available to work with us,” said Ossig. Around 50 percent of the country’s medical facilities have been destroyed, according to estimates by the South Sudanese ministry of health, and those that are open are running at a lower capacity. Dr Thuou Loi Cingoth, the director general of the ministry of health, said the government has a three-step plan to restore access to medical care. The first is to rebuild and provide infrastructure – buildings, electricity and equipment. Cingoth said the government was working on this but didn’t specify how. “Number two, supplies – drugs. We are doing that,” Cingoth said. “South Sudan is the only country in the region where drugs are provided free of charge,” he added, sitting below a banner in his office featuring motivational quotations by intellectuals such as Ayn Rand. In fact, the free drugs are provided by donor countries or humanitarian organisations. The third point in the government’s plan is to make sure that the country has enough doctors and support staff. Many medical personnel have fled the civil war, leaving the country with a shortage. “We don’t have a single doctor in the Bentiu hospital,” said Wigo Gual, the director general for health in Unity State. During the spring of 2014, the Bentiu hospital, the largest in Unity State, became the scene of one of the most horrific massacres in the region. 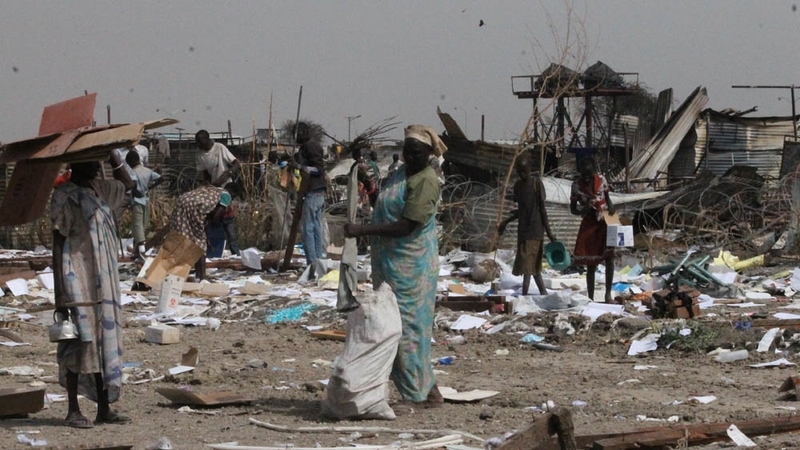 According to a UN report, residents of Bentiu often took shelter in the hospital. The town had flipped back and forth between government and opposition control in the weeks before April 15. But on that day, opposition fighters launched an attack on it. The fight made its way into the hospital, where residents had fled, seeking safety. “Nuer opposition fighters arrived at Bentiu Hospital, started calling names of government officials and shot and killed several individuals of Dinka ethnicity they appeared to recognise. 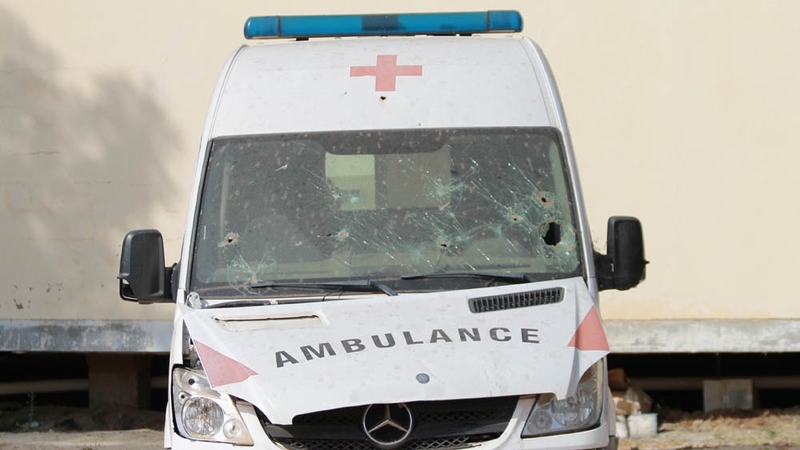 Reportedly, they also fired through the closed door into a staff room where Nuer medical personnel was hiding and killed at least four persons,” the UN report stated. According to witness accounts, at least 33 fighters, medical staff and civilians were killed. 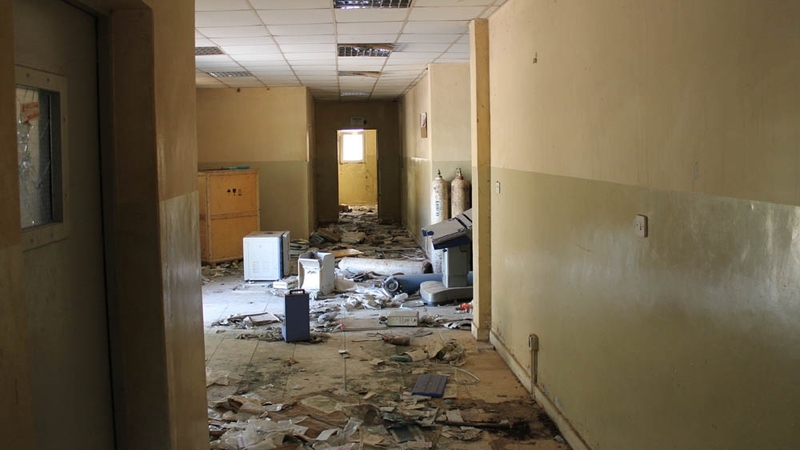 The hospital also lost its much of its equipment and 17 doctors, who fled to less dangerous areas, Gual explained. “Now, even if they were to move back, what would they return to? The hospital no longer has the resources they need to do their jobs and the town remains too unsafe to send valuable medical equipment to,” Gual added. Some 20 months after the Bentiu hospital was attacked, much of the carnage remains. It has been looted many times over. Bullet holes mark the walls and an ambulance that sits beside one of the buildings. Glass and syringes litter the floor. Only a mobile clinic run by the International Rescue Committee and a UNICEF child nutrition site were running when Al Jazeera visited, but a maternity ward run by the IOM has just opened. They serve about a tenth of the number of patients the hospital used to. One of the doctors who was in the hospital at the time of the attack, and who asked not to be named for fear of reprisal, described what happened. When asked why the fighters had entered the hospital in the first place, he looked puzzled. He had come to accept that in this civil war, killing the enemy had become more important than protecting your own people.